Hello Everyone, its been so quiet here lately. There's a reason for this, that I will soon share with all of you. Today I wanted to share this watercolor card I made just recently for a friend who lives so far away. Sometimes we create for a just because. 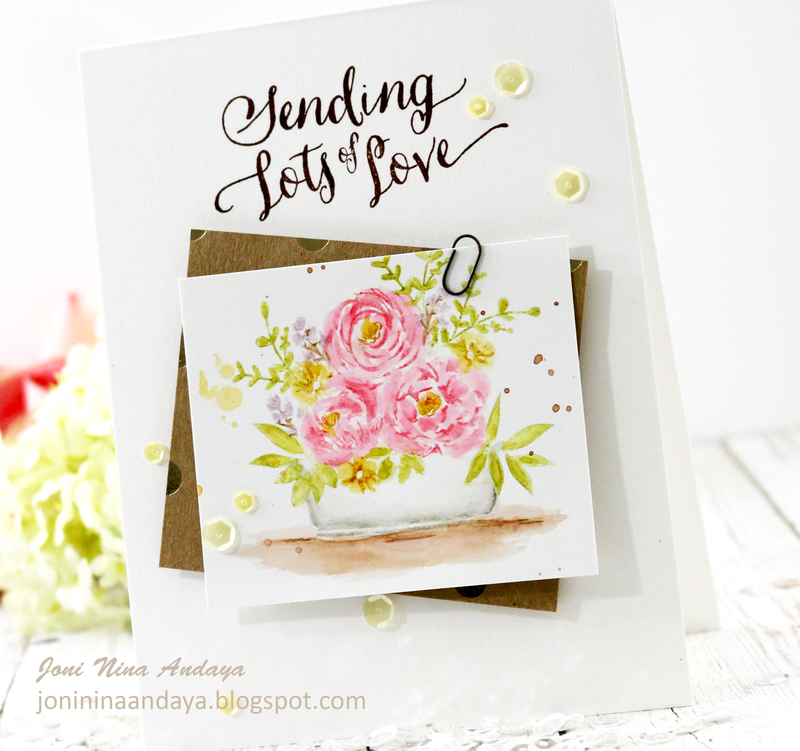 Heartfelt Holiday, Pretty Little Peonies, Valentine Wishes, and Fresh Baked stamp sets. To begin I stamped the images one by one using the Distress Marker. I colored the clear stamps and stamped them on the watercolored paper. I added very little water using my watercolor brush as I go along image by image. Next, once the image panel was finished I then cut the panel and adhered it on a gold polka dot Kraft patterned paper that I also cut. For added interest I added the tiny bitty paper clip from Tim Holtz, and Pretty Pink Posh Lemon Meringue sequins in 4mm and 6mm. So pretty! Can't wait to hear your news! 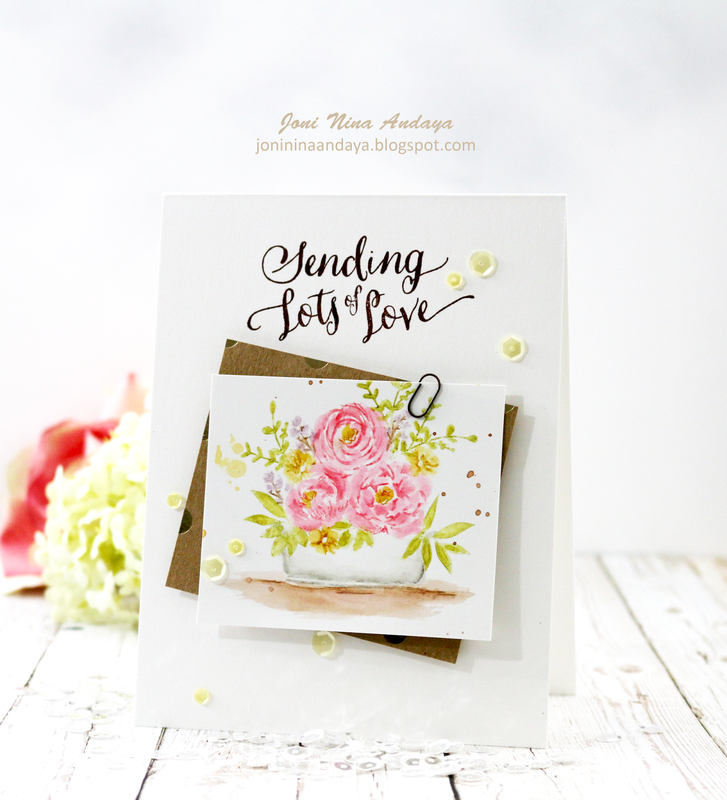 Truly gorgeous card!! Love the subtle colors! Beautiful!! Have been missing your posts!! Can't wait to hear what news you have to share with us! So beautiful! LOVING those flowers!!!!! So pretty Joni...you've been missed. * Gasp* - sublimely beautiful! Your card is really amazing!!! I love how it feels like it's a tiny work of art (it is!) clipped up on a wall. Your strong black sentiment above it is perfect. Love, love this!! WinnieWalter - Day Four Release Day! Pretty Pink Posh Birthday Celebration!! !